Based on the highly successful introduction of its new wired microphone line earlier in 2002, Shure Incorporated is expanding its Performance Gear family to include 17 affordable wireless systems. Formerly T/UT, these wireless systems are updated with a refreshed receiver design and packaging to make them even easier to choose and use. Performance Gear Wireless systems feature receivers outfitted with an attractive sloped metal front panel and repositioned LEDs making them easier to view and understand. Additionally, receiver rear panels are updated with easier to read two-color labels highlighting connectors and controls. The wireless system offers a variety of UHF and VHF diversity configurations designed expressly for vocals, instruments, and presentation use including popular Beta 58, Beta 98, PG58, and SM58 transmitters. 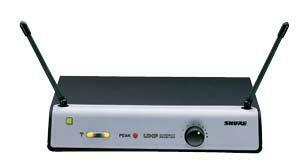 Model numbers for Shure's Performance Gear wireless systems remain unchanged from those used by their now discontinued predecessors within the diversity T and UT Series lines. Single antenna T Series Wireless will continue to be sold under the T Series name.